These Cash Disbursements Journal Sheets are part of the Abingdon Church Financial Record System. 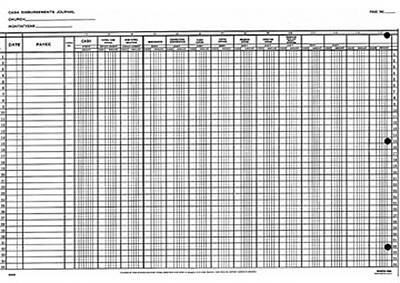 Each sheet is folded and printed on both sides and includes blank extra columns. 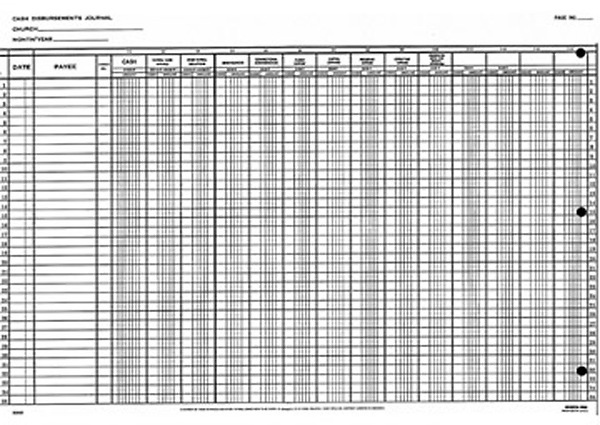 The sheet is punched for a three-ring binder, and measures 16” x 11”. Available in individual sheets or in packages of 12. Using the non-denominational system these envelopes are part of enables church officers and assistants to maintain accurate, complete, and understandable records. See all the other components in the Related Products Section below. Check out our on-line selection of Sunday School Record Books and Attendance Supplies. Accurate records help bring order to the world of Christian ministry and help Church leaders minister more effectively to those they have been called to serve.